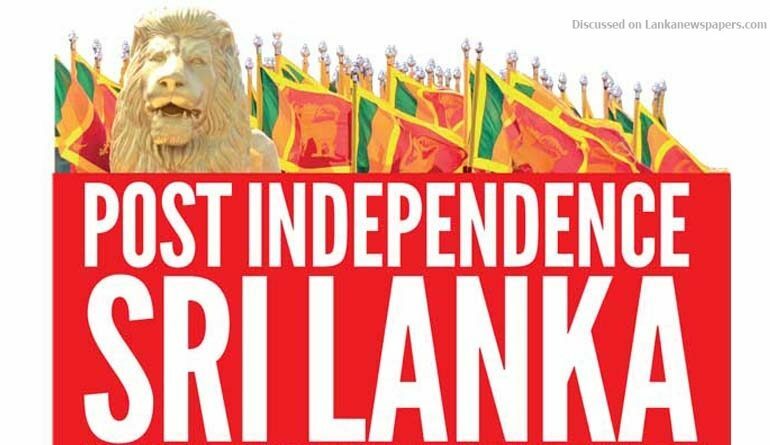 We complete seventy years of independence next week and enter the 71st year after regaining independence. The country has progressed, but not as much as her potential. Other countries in Asia that were at a much lesser economic level have progressed by leaps and bounds. Despite better economic and social infrastructure and an efficient bureaucracy and system of justice and a thriving plantation economy, we failed to achieve rapid economic development. On the eve of our 70th anniversary of independence, it is opportune to reflect on the reasons why the economy performed less than its potential and much less than most South East and North East Asian countries. The nation’s economic performance over these seventy years has had disappointments, setbacks, successes and achievements. Foremost among the reasons for the disappointing performance is the country’s ethnic conflicts, terrorism and a civil war. The ethnic disturbances of 1958 were a severe setback as it saw the first wave of a brain drain of the country. Scientists, doctors, engineers, accountants and academics left the country. Disturbances in 1977 and the July 1983 ethnic violence saw a further erosion of the country’s economic capacity. The insurgencies of 1971 and 1988-89 too resulted in an exodus of skilled personnel. These brain drains keep continuing to this day with brilliant graduates leaving the country for higher studies and not returning. The reasons for the continuous brain drain is more complex than the issues of ethnic violence. The whole environment of the country’s economy, politics and society are dissuading talented youth remaining in the country. Consequently institutions have been seriously weakened. Another factor has been the frequent changes in political regimes and the consequent uncertainty in economic policies that have dissuaded investors. The changes in political regimes have led to drastic differences in policies, especially with respect to foreign investment and trade policies. Economists have characterised the country’s development experience as one of “Lost Opportunities”. It was also one of undermining investment and dissuading investors. One of the most serious lost opportunities was after the liberalisation of the economy in 1977, when the country was on the verge of take off into the kind of growth momentum the Newly Industrialised Countries of South East Asia had achieved. Just at the time when large international investors had planned to set up their industries in the country, the ethnic disturbances occurred and these investors went to other countries like Thailand, Singapore and Malaysia. The country has not recovered from this setback even after the end of the war in 2009 and the new regime in 2015 that restored law and order and the rule of law. Foreign direct investment of the type that would boost the economy and enhance exports is woefully inadequate. The threat of nationalisation of the tea estates till the 1970s and their nationalisation in 1974 is a sad episode in the country’s economic history. The nationalisation of the estates that was the goose that laid the golden eggs, resulted in a severe drop in tea production and export earnings. Furthermore the estates ran at a loss and became a fiscal burden. The government of Chandrika Bandaranaike Kumaratunga realising the folly of her mother’s government, privatised the management of estates and revived estate tea production. Loss making state owned enterprises (SOEs) have been a serious drain on the public finances and have for many years distorted public expenditure and deprived the government the capacity to invest in economic and social infrastructure. Still many politicians are against the divestiture of loss making state business enterprises owing to ideological misconceptions and vested interests. These ideological positions have been a serious setback on the country’s economic development since independence. Ideological misconceptions and lack of realistic and pragmatic policies have characterised most the post independent period. Unless after seventy years of impractical ideologues, governments realise the need to adopt policies that bring benefit to the country rather than pursue uneconomic ideological policies, the country’s economy can grow only at its current pace of 5 percent or less. This critical assessment of some of the key reasons for the economy’s inability to achieve economic development does not mean that the economy is devoid of significant achievements. The economy grew at around 4 percent per year between 1950 and 2017. This rate of growth is not an unsatisfactory one. However given the initial conditions at independence, the potential for growth was much higher. The reasons discussed here are some of the factors that depressed growth. The achievements of the Sri Lankan economy includes the increase in per capita incomes, reduction of poverty and unemployment and much higher consumption levels among the middle and lower income levels. The large number of motor vehicles, widespread increase in household consumer durables like television, gas cookers and the massive use of phones are illustrative of this. It must also be said that much of these consumer durables and higher incomes are also due to remittances from abroad that account for about 7 percent of GDP. Furthermore there have been significant developments in agriculture. Ceylon in 1950’s with a population of just 7 million imported about half her requirements of rice. Sri Lanka with a population of 21 million today is self sufficient in rice in a normal year. The proudest achievements of independent Sri Lanka are its social indicators. With literacy more than 90 percent, life expectancy in the mid 70s, low death rates, maternal mortality rates and infant mortality rates, Sri Lanka has achieved much higher levels than that of countries with higher per capita incomes. Though some have argued that the social achievements have been at the cost of economic development, the several factors discussed in this article are far more responsible for the slow economic growth. Unless the political culture of the country is changed and pragmatic economic policies are pursued, the trajectory of growth cannot be raised much above its current 5 percent. In the words of Lewis Carol in Alice in Wonderland, we are “a slow sort of country where it takes much running to keep in the same place”.